What Are The Best Treatments For Sacroiliac Joint Pains? The sacroiliac joint is the bony pelvis that lies between the sacrum – triangular in shape and is located at the lower part of the spine, and the ilium or iliac bones – the two large bones that somewhat resembles the shape of a heart. 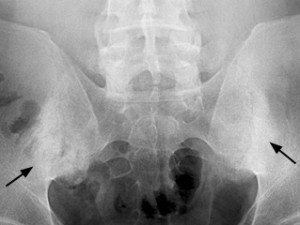 The sacroiliac joints are the ones responsible in connecting the spine onto the pelvis. A lot of people complain about the pain that they are feeling in the lower back area, and about 12 to 25% of the time low back pain is due to dysfunction or strain of the sacroiliac joints. It is often mistaken as a simple lower back pain caused by bad posture or being in an uncomfortable position for a long time. Just like with any other joint in the body, the sacroiliac joints have an outer layer form of protection called cartilage. These cartilage layers allows for a little movement which helps in managing any shock that may hit the area, protecting from further damage. Over time, the cartilage may wear out or a person may experience a work injury or auto accident causing significant painful injury to the SI Joint. This may necessitate treatment with a Phoenix workers comp doctor. Basic options such as rest and applying ice to the affected area may help in reducing the pain. Ice packs can help in reducing the inflammation and this can be applied as often as giving 15 to 20 minute intervals. This can be alternated with heat to the affected area once the inflammation or the pain subsides in order to continue its healing process. Pain medications like acetaminophen along with anti-inflammatories may reduce swelling and inflammation. SI joint injections with cortisone may relieve pain for months at a time. These are performed under fluoroscopy for best results.